Craig Taylor found us here at the Fit Father Project back in May 2017. Since taking the plunge to join our FF30X 30-Day Program, Craig has gone on to lose an impressive 109 lbs. Craig is one of our superstar students. I was lucky enough to catch up with him recently to find out where his journey started, what he's doing now, and where he plans to go in the future. Read on to see how Craig went from a 306 lb self-confessed ‘Couch potato' to 109 lbs lighter and running his first 5km race, in less than 6 months. Craig and I began our conversation with his mother's recollection of first grade, when he had his tonsils removed. From 1st grade onward, Craig consistently gained weight and sadly his mindset became that he was fat and that was it. Whether he was 20, 50 or even 100 lb overweight, it didn't matter. He had come to accept that that was just him. Although Craig never ate breakfast, he would basically eat whatever he wanted for lunch and dinner. The biggest issue with his eating was evening snacking when he would eat ice-cream, chips, cookies and the like. He would also never drink water, but would instead drink regular soda drinks at lunch, dinner, supper and throughout the evening. He would never do exercise and says he was the epitome of a couch potato. He would get in after school and just sit in front of the TV for the rest of the day. In the early 2000's, Craig did have some weight loss success on the body-for-life program, losing 45 lbs over the 12-week course. However, due to his grandfather passing away, he came off the program and never got back into the swing of things. The result was a 65 lb weight gain and a drop back past square one. Craig continued to gain weight at around 5-10 lbs each year until he had finally had enough. In April 2017, Craig was at 306 lbs and was at his heaviest ever. Following a trip to his Doctor, he saw our Facebook ad and decided to get our 1-Day meal plan. Throughout May and June 2017, Craig lost 15 lbs using just the information provided with the meal plan. After reading more information about our full FF30X program, Craig knew it was sustainable and not a fad. Having had friends try other plans that required the purchase of additional meals or products, he knew that FF30X was something different. During our famous yearly ‘Father's Day Fire Sale', Craig knew this was the time to go all in, so he officially joined the FF30X program on July 12th, 2017 at 291 lbs. Craig found a clearing in his schedule, following some trips away that he knew would not allow him his best start, and buckled down on the 30-Day FF30X plan. Craig didn't want to expect too much from himself initially, so he set his goals to be spurred on by his results. Initially, Craig didn't have and still doesn't have a weight goal in mind. He is learning more about his body at this point and is happy to see what can happen as he continues his new healthier lifestyle. On 30th August 2017, just 3 months after using the Fit Father Project principles, Craig hit his first milestone by achieving a total of 50 lbs weight loss! You can see how excited he was from his Facebook post, below. Following this, Craig continued to blaze a trail and on 3rd and 4th October 2017, he posted these little gems for us all to see. 70 lbs of weight loss in less than 5 months! 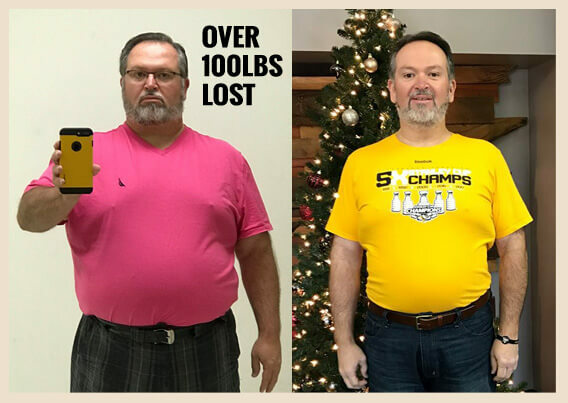 As you know, Craig didn't stop there, and on 12th December 2017, he had lost over 100 lbs in weight! During the 2017 holiday season, Craig visited home and wanted to be able to enjoy all the homemade tasty treats that families tend to prepare. This time around though, there was something different. Craig knew he had had a positive mindset shift and wasn't worried about falling off the plan. He knew that once the holidays were over, he would be back to eating healthy and exercising as planned. Although he can't quite pinpoint when or why the mindset shift happened, he recognizes that the support and regular information from the Fit Father team and his fellow FFP ‘Brothers', has made it easier for him to continue the program and stay on track. Craig has got to the point where the habits he has learned through the Fit Father Project have created a healthier lifestyle for him. When he wakes, he rehydrates with 16-32ozs of water, followed by some stretches. He continues to drink water throughout the day and has not drunk soda since starting the plan. He finds his fasting days much easier now too, making sure he doesn't have food in the office, so there are no temptations. Generally, Craig gets his workout in, in the evening when the gym is a bit more empty. This is a big change from his ‘couch potato' days. One of the biggest changes is in his sleep schedule, where Craig says he is now making sure to get 7 hours of sleep every night. Before, he was rarely getting more than 6 hours. So what now for Craig? As Craig hit 2 huge goals in quick succession, which were losing 100 lbs, and getting below 200 lbs, he wants to remain consistent with his new healthier lifestyle. Craig has also continued to run since completing a 5km race and hopes to keep this going. His next weight goal is to get to 180 lbs and then see how things are going. Summary: What lessons can you learn from Craig? Lesson #1: You can start to get great results using just our free resources. Like Craig did, you can learn about healthy eating and how to prepare amazing meals from our 1-Day Meal Plan. You can also start an exercise regime with our fantastic 24-Minute Fat Burning Workout. Lesson #2: There is more to weight loss than just healthy eating and exercise. As you've seen from Craig's story; sleep, hydration, and mindset are also factors that you need to consider when trying to lose weight. Our FF30X program covers all of these areas in detail. Lesson #3: FF30X is not a diet, it's a lifestyle change for the long-term. We don't advocate going on a diet, as diets tend to have a timeframe attached to them. FF30X was built to teach you the habits that you can use for long-term, sustainable weight loss, and good health. Lesson #4: It is possible to lose weight, even if you've struggled before. One of the biggest lessons you can learn from Craig is that you can lose weight, no matter what you've tried before, or what shape you're in now. Craig was over 300 lbs and did no exercise. He's now under 200 lbs and running 5km races! Lesson #5: Consistency is key. This is the habit of all habits. Remaining consistent, no matter what! If you can take the basics of a healthy lifestyle and do them on a consistent basis, you will be surprised at how quickly your life can change for the better. *Please know that weight loss results & health changes/improvements vary from individual to individual; you may not achieve similar results. Always consult with your doctor before making health decisions. This is not medical advice – simply a case study of what Craig has achieved.